Outcome of the community consultation process – no surprises. After a community consultation process, the developer is in the final stages of preparing amended plans for submission to Council. In Protect Newport’s view, the plans HAVE NOT to any significant degree addressed the community’s major concerns of height, bulk, density, neighbourhood character, setbacks, parking and traffic. In summary… there are still 43 dwellings, three stories, same building and occupant density, same height and bulk, as the plans presented during the workshops. You will see by the letter accompanying the plans, the developer is still maintaining the position that VCAT and Council reviews/hearings give them approval to do what they wish, and the community feedback is therefore largely ignored. Here is the letter from developer. Quick survey – after reviewing the latest pre-submission plans, please rate the developer’s community consultation process. The developer has scheduled a final community workshop for Thursday 13 June 6.30pm – 8pm at The Chambers, level 1, Williamstown Town Hall, Ferguson Street. This workshop by the developer is “to provide an opportunity for final discussions between the developer and residents prior to plans being submitted to Hobsons Bay City Council”. We suggest residents go along and provide further feedback before plans are submitted to Council. A fortnight ago thereabouts, residents received a letter summarizing the last workshops and notification of an upcoming workshop for Monday the 6th May. We have received advice Monday the 6th May workshop has been deferred. “You will have received recent advice of a workshop proposed for 6 May at which amended plans for this site were to be presented by RAIO Pty Ltd for further community comment. I am writing to advise that RAIO Pty Ltd is still in discussions with Hobsons Bay City Council and the Council’s Urban Design Consultants and therefore still in the process of refining the design for the proposed redevelopment. It has therefore been decided to defer holding next week’s proposed workshop so that RAIO Pty Ltd has the time to consider both Council and community feedback and prepare the revised plans to display. 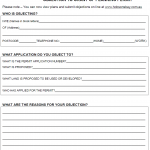 You will receive a copy of the revised plans via direct mail when they become available and also be advised of the revised date for the workshop in the near future.” – Lindy Amos (Collective Possibilities), consultant for the developer. After our last post,where the BIG ISSUES survey was uploaded for the benefit of people who cannot make it to the developer’s workshop, people have asked if they can complete the survey even if they are going to the workshops. In fact, the more people who complete the survey, the better the developer will understand what should be in scope at the workshops. Following the developer’s recent ‘drop-ins’, you may have received a letter from them inviting you to attend a workshop. Here is a copy. Each workshop is limited to 32 places, in case you cannot secure a place or make the workshops, we want to be in a position to provide your views to the facilitators and developer at the workshops. 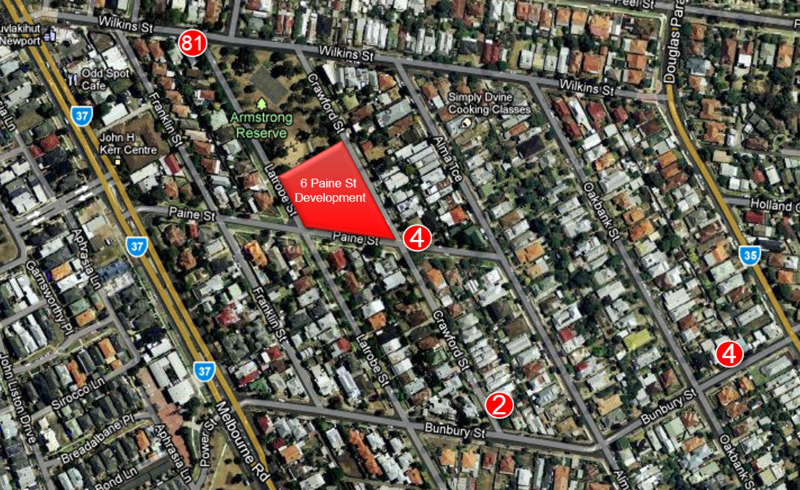 Hobsons Bay Weekly article: Newport developer stays the course. An article regarding the 6 Paine St development has just been published in the Hobsons Bay Weekly. Article below by Hobsons Bay Weekly.. or go to the article at the Hobsons Bay Weekly website. Artist’s impression: A Crawford/Paine St perspective of the latest 3 storey (or is it 4 storey) proposal. Newport developer stays the course. A WOULD-be Newport developer is hoping to be third time lucky after two previous plans were rejected by the Hobsons Bay Council and the Victorian Civil and Administrative Tribunal. The Weekly understands that Domain Hill, which wants to put a multi-storey residential building on the former Newport Timber Yard, has hired a public relations firm to garner community favour the third time round. Domain Hill first proposed a three-storey, 46-dwelling development for 6 Paine Street. 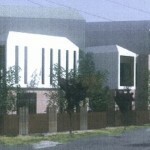 As reported by the Weekly, after it was knocked back by the council, residents said they felt “blackmailed” by a developer’s letter which indicated that if residents did not accept a new design, a four-storey, 136-dwelling social housing complex could be built without council approval. The council denied this could happen. The developer’s second proposal was for a four-storey, 42-dwelling apartment block. More than 360 objections were lodged against the second plan. Protect Newport member Anthony Simmons said the latest plan was “essentially the same overdevelopment”. “They’ve failed to submit an appropriately sized proposal that respects the neighbourhood character and surrounding predominantly single-storey homes. It remains a single, massive building containing 43 units, occupying most of the site, up to three storeys, plus a fourth-level rooftop deck and staircase structures. The developers new consultation process. Developer’s community update fact sheet 1. Developer’s invitation to provide feedback. The developer abandoned talks with community representatives (when representatives proposed minor design compromises which were unacceptable to him) and created an alternative consultation process, for which he has hired consultants Collective Possibilities to act as facilitators. They have started with a door knock and letter campaign, inviting residents to information session ‘drop ins’. The developer’s team has scheduled two information ‘drop ins’ sessions: Sunday 3rd (anytime between 11am-12:30pm) and Monday 4th (anytime between 6:30pm-8:30pm) at the Williamstown Town Hall Chamber Room. Failure to meet Council infill guidelines. A single monolithic building design, using the majority of the site, with no ground level break around the entire site perimeter. Overall height and mass (three stories) far in excess of the surrounding buildings. With inadequate setbacks for such a large building. Complete failure to respect the neighbourhood character. Overlooking the park and children’s playground. Includes too many residents and vehicles and exacerbate current local traffic and parking issues. A design that will forever negatively alter Newport’s character. All of which are products of a blatant overdevelopment of this site. The developer, project investors, and designers, are expected to be there to receive your feedback. The facilitators will subsequently report the feedback and pertinent information back to the developer. The facilitators propose to hold community workshops (20th and 28th March) at the Williamstown Town Hall. Again, the developer, investors, designers, are expected to be there with the facilitators. The workshop scope, objective, and format are yet to be clarified. But the workshop outcome will be reported to the developer. According to the facilitators these feedback drop-ins and workshops are primarily for the developer to gather community feedback for him to make decisions and potentially be include in his application to Council. There is yet to be a clear indication the developer will respond to this feedback and workshops with changes to his application along the lines residents would be seeking. This process is being organised by the developer independently of statutory process. Processes which failed to get him his way two times previous. The developer abandoned talks with community representatives (when representatives proposed minor design compromises which were unacceptable to him) for a new process. The developer will use this process to support his application to Council, and potentially in VCAT to get the development approved. Although not officially advertised for objections, the Timber Yard developer’s latest application is now available for viewing. It seems he is failing to listen to VCAT and residents, and has submitted fundamentally-the-same application again. He has completely missed the opportunity to submit a different proposal that will integrate into our neighbourhood (and it’s character) without dominating it. Council are considering the developer’s request. It is clear by the developer’s indifference of the timing of any consultative meeting, he is not really interested in in incorporating residents’ feedback into his design. Why Déjà vu? The previous two consultative efforts resulted in the developer suspending meetings, not incorporating resident feedback and submitting his plans anyway. What’s the new design like? Still a massive dominating development, incongruous with the neighbourhood and neighbourhood character. 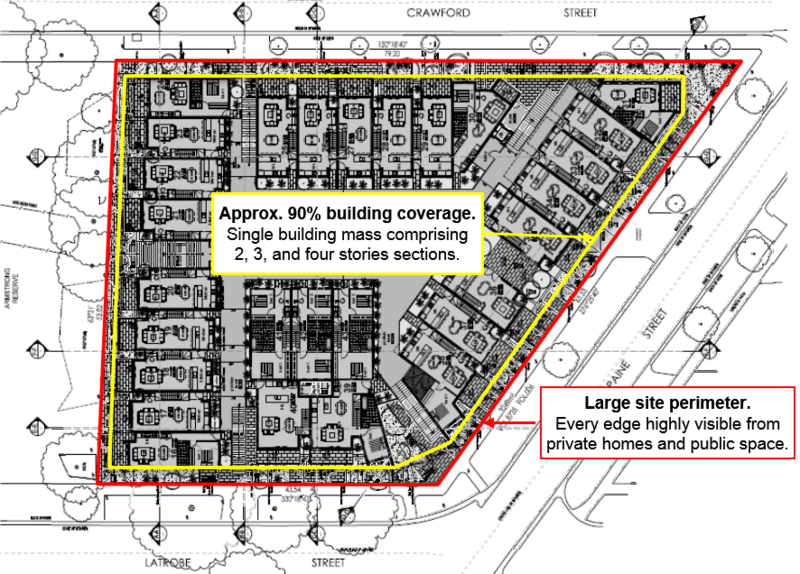 43 dwellings (8 x 1BR, 32 x 2BR, 3 x 3BR) in a single building mass occupying the majority of the site. Dwelling density increased by an additional unit since the last application. Predominately three stories around the perimeter with some two stories on corners. Fourth story central tower comprising rooftop private open space and enclosed (ugly) stairwells. Dominating third level cantilevered forward. Pitched roofs added, but framed and blocky facade. Predominately concrete construction with brick and masonry cladding. Why Déjà vu? There has been no attempt to reduce the dominance, density, and incongruous design. View from Paint and Crawford Street intersection. We wait to see what Council will do with the developer’s request; and for the advertising period to start so residents can object as necessary. The developer’s application PA1226036 is now on Greenlight, with a copy of the documents below. Meetings with the developer – progress update. The developer contacted an objector representative to discussion the issues of the Timber Yard development and try to come up with a design that may be acceptable to the community, Council and VCAT. Representatives for objectors had discussions with the developer where issues with the previously rejected design were considered. Amongst other things, examples of more acceptable developments and styles were presented to the developer. The developer came back with draft amended design, which although had some improvements with gaps and roof lines, did not satisfy residents primary concerns of bulk, height, form and materials. A further meeting took place where the improvements and failings were discussed and residents proposed a design that (as a minimum) may be more acceptable to the community. The developer is considering this and will come back to us shortly. If a suitably responsive re-design is returned by the developer, this will be the subject of a residents meeting; to review the proposal and provide a public acceptance position back to the developer. Hopefully this process will result in a re-design that deals with community, Council and VCAT concerns; and enables the site to be developed in a way acceptable to all parties. Developer in discussions with Residents and Council. Representatives of resident objectors are in discussions with the developer, Domain Hill, regarding revised plans for the Timber Yard site. Although we have seen sketches of the revised form, we are waiting on additional style and materials details. We will then begin a formal cycle of receiving community feedback. The developer has also met and continuing discussions with Council’s planning department. The Hobsons Bay Leader had a brief article regarding current events, read full article here.